I had to just pry myself off Pinterest in order to get myself to write this post. That thing is like a freaking black hole...once you start you're screwed! Do you have someone in your life that you know 100% that no matter what, no matter where you are in your life, no matter what your age, will be there for you? That person for me is my best friend Megan. We have known each other since kindergarden...19 years we have been best friends. I can truly say that she is my longest friend. The memories we have...drawing dolphins and chipmunks in the first grade, making creepy crawlers, having our mothers call each other to make sure that it was okay we had play dates...and that was all in the first few years of knowing each other! Life separated us for a few years (her family moved to California, mine stayed in Illinois), but we found our way back to each other and it was as if no time had ever passed. The older we get, the closer we become. I just turned 25-years old at the beginning on August and I am so grateful to know that I will have Megan as my best friend for the rest of my life. We have been there for each other through everything - the good, the bad. She puts up with my crap, I put up with hers. life since kindergarten!! Love you my dear :)"
Yup, I think that says it all. RIght back at ya, Meg! Megan recently moved from Boston to Pittsburgh to receive her doctorate in audiology...why can't I be smart like her?! She set a goal for herself - to start cooking more. I fulling approve of this goal because I am reaping the benefits with this awesome recipe! 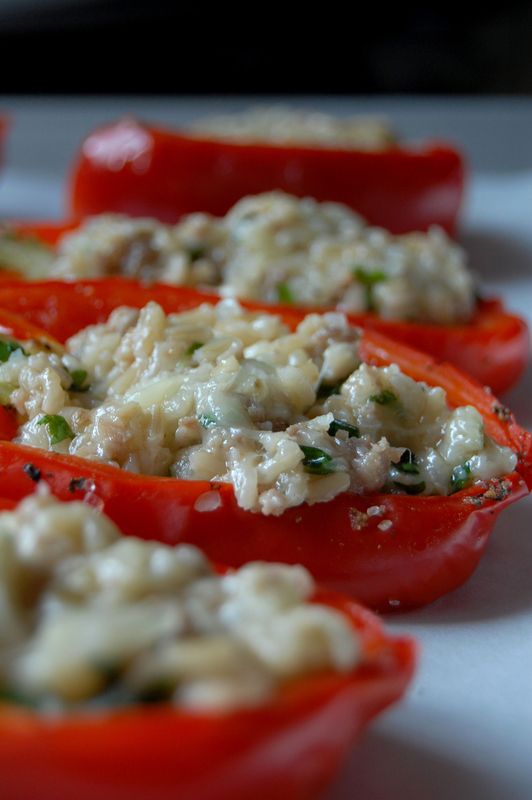 I have heard of stuffed peppers before but had never actually tried one. As a result, I did not really have any expectations or standards going into this recipe. That is what I love about new recipes - not having any idea how things are going to turn out or taste, but having the excitement of trying something new. When I make this recipe again, I will probably make some changes to the recipe. While it is delicious exactly the way it is, I would have loved to have more meat in the stuffing. It is also incredibly rich with cheese...one of my favorite guilty pleasures, but I may have lessened that amount in the recipe. I am planning a trip to Pittsburgh this fall to visit Megan. I cannot wait to hang out with her for a few days, catch up, cook, drink, watch movies, explore Pittsburgh! Don't be surprised if you find a few new blog posts from that post! 1. Adjust oven rack to upper-middle position and heat broiler. Place peppers in microwave-safe bowl, cover, and microwave on high until just tender, 3 to 6 minutes. 2. Meanwhile, heat 1 tablespoon oil in large nonstick skillet over medium-high heat until just smoking. Add pork and pork sausage and cook until no longer pink, about 5 minutes. Add onion and cook until softened, about 4 minutes. Add garlic and cook until fragrant, about 30 seconds. Stir in rice and cook until heated through, about 2 minutes. Off heat, stir in 2 cups cheese and parsley, and season with salt and pepper. 3. Pat peppers dry with paper towels and season with salt and pepper. Brush baking sheet with remaining oil. Place peppers cut side down on baking sheet and broil until spotty brown, about 3 minutes. Flip peppers and fill with pork mixture. Top with remaining cheese. Broil until cheese is spotty brown, 3 to 5 minutes. Serve.